The Big Breakfast Diet: Eat Big Before 9 a.m. and Lose Big for Life was created by Dr. Daniela Jakubowicz, a clinical professor at Virginia Commonwealth University and the Hospital de Clinicas Caracas in Venezuela. She promises dieters that they can indulge in cravings for foods such as pizza and chocolate and still lose weight, so long as these foods are eaten before 9 a.m. The plan is based on the results of a study that compared the effectiveness of a low carbohydrate diet to a diet that included a big breakfast with a moderate intake of carbohydrates. Even though those on the big breakfast diet consumed 155 more calories a day, after eight months the members of the big-breakfast group lost more than 21% of their body weight compared to just 4.5% for the low-carb group. The connection between breakfast and weight loss has been understood for a long time but Dr. Jakubowicz has developed this concept further by specifying the amounts and timing of protein, carbohydrates and calories to be eaten throughout the day. Jakubowicz explains how the body processes food differently depending on what time of day you eat. She says that a big breakfast will boost metabolism, reduce appetite during the day and eliminate cravings, which will not only help you lose weight, but also ultimately reduces your risk of diabetes and heart disease. Each day starts with a big breakfast that provides about 600 calories and is high in both protein and carbohydrates. Lunch and dinner are low in carbohydrates and provide less calories bringing the total daily calorie intake to around 1200. The book includes a twenty-eight day meal plan with recipes. The Big Breakfast Diet advocates eating something sweet such as chocolate or cookies as a component of breakfast every day. It claims that eating sweets in the morning when your serotonin levels are highest and thus your cravings are at the lowest, will help to reduce cravings. Conversely if you restrict carbohydrates, this will exacerbate cravings, leading to binge eating and unhealthy snacking. Pizza, turkey, cheese, steak, bacon, pancakes, bread, cake, cookies, chocolate, candy, ice cream, smoothies, fruit, vegetables. The Big Breakfast Diet says that an exercise plan is not necessary to succeed with this diet, but an increase in daily activities is encouraged. 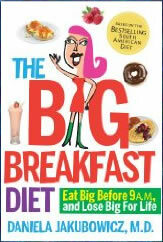 The Big Breakfast Diet: Eat Big Before 9 a.m. and Lose Big for Life retails at $11.95. Eating a breakfast that contains protein reduces hunger and cravings during the day. A moderately high protein intake reduces appetite and helps to maintain lean muscles while on a reduced calorie diet. Will appeal to dieters who don’t want to give up their favorite foods. Includes a twenty-eight day meal plan with recipes. The research on which the diet is based has been criticized by some medical experts. Encourages unhealthy food choices such as pizza, bacon, ice cream and candy. Does not emphasize the importance of selecting high nutrient foods for health. Calorie intake is too low, especially for physically active individuals. Although there is definitely evidence of the beneficial effects of eating breakfast, it is most likely that the dieters in the study lost weight because of the very low intake of calories and the relatively high daily intake of protein, rather than the composition and timing of each meal. The Big Breakfast Diet places an excessive emphasis on specific ratios of protein, carbohydrates and fat and a high intake of calories for breakfast such that the importance of the nutritional quality of the diet is completely overlooked. When following a calorie-restricted diet it is essential to carefully select foods so as to ensure nutritional adequacy. Unfortunately, The Big Breakfast Diet promotes unhealthy food choices that will ultimately result in negative effects on health over the long term. after looking at her descriptions i think the diet could work, if u include exercising. the food that is recomeended is JUNK FOOD. subtract fruits and vegetable. you need exercise to burn the fat from the foods. This review is completely absurd. I have the book and it does not “recomend” junk food like you guys said. There is plenty of veggies and fruit and she explains how much sugar they have and vitamins your body needs. Any diet that tells you you are not allowed to have carbs or sweet its simply a recipe for disaster because no humane has ever lived without them!!! This diet is simply logical is how you body works. You can eat up to 3000 calories SO I RECOMMEND YOU ACTUALLY READ THE BOOK INSTEAD OF GIVING PEOPLE THE WRONG INFO . I have diabetes and this diet has completly changed my life a have never been so healthy I have lost 4 1/2 pounds in 3 weeks and my energy level has improve not to mention my humor. And I check with my Dr. and my insulin levels have also improve thanks to her I basically owe her my new life!! The review doesn’t use the word junk food, but identifies some food as unhealthy which is a matter of opinion. While you may think chocolate cake is a healthy food choice, many others would disagree. It isn’t fair of you to criticize the reviewer because her interpretation of the book was different than yours, she was just giving her expert opinion and you are free to take it or leave it.